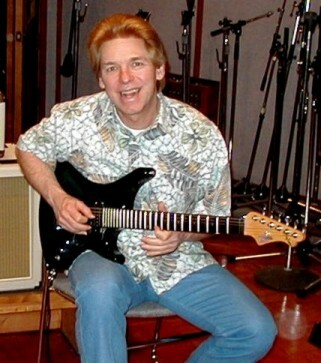 Jay Graydon is a legendary Los Angeles based studio musician, session guitarist, writer and producer. When other studio legends had tried and failed to meet Donald Fagan & Walter Becker's seemingly impossible expectations, Jay famously nailed the "Peg" solo on Steely Dan's Aja album. Jay won a Grammy for his co-writing of "Turn your love around" with Luke and Bill Champlin, which became one of George Benson's biggest hits. Jay was instrumental in getting Luke started on the session scene in the mid 1970's when he recommended his own clients to the teenage Lukather, who as we know rapidly emerged as an equal to the likes of Jay, Larry Carlton, Dean Parks, Ray Parker Jnr, Lee Ritenour and other legendary studio guitarists. Joseph Williams and Steve Porcaro have also worked extensively with Jay in recent years. Jay remains one of the busiest studio musicians and producers on the West Coast and over recent months, we've emailed to put together this fascinating insight into Jay's collaborations with the Toto guys and his own recent projects. Will: Hey Jay. It's well known that you helped Luke get a foot in the LA session scene. When did you first meet Luke and what do you remember about him as a teenager? Jay: Yo Will. I seem to remember we met during a rehearsal for some project Foster and I were working on. Luke was polite and had his nose so far up my *** he could hardly breathe (just kidding). We had fun talking about what guitar players, and talking about music and gear. I can’t remember the first time we worked together on a session but I do remember he played very well! He had all of the elements needed to be a great studio guitarist - quick creativity, coming up with great parts, solid "time", a good sound, and played "in-tune"!!! Regarding helping Luke get work in the studios, it is important to realize how stuff like this goes. In some cases the last thing a studio guitarist would to do is to recommend a great guitarist that may end up with the account. Such thinking is silly, as great guitarists will surface without the help. There was no doubt Luke was going to be a great studio guitarist. Further, we had become best of friends quickly. It was time for Luke to get known quickly so I began recommending him for any session I could not make. Shortly thereafter, I decided to make a career move to record production and songwriting. At that point, I told all my accounts to call Luke. Ironically, Luke may have had the shortest career of a first call studio guitarist to date. Yeah, TOTO started pulling hits and going the road so no time for Luke to do sessions ending his short run in the studios. Will: Luke has often credited you as one of his mentors and guitar "Sensei", and mentioned you on his Starlicks instructional video in 1984! Jay: Man, Luke stole all of my licks and I want them back. Hahaha. Will: Hahaha! You must have had some hard laughs with Luke over the years! Are there any particularly notable moments which you'd like to share with us? Jay: Yeah, Luke and I have had major laughs over the years! You want a story? The following was at my expense but it was so funny I did not care. The session was at Larrabee. I think Al Capps was the arranger. Not sure of the artist but it may have been Juice Newton. Other than me and Luke on guitars, Jeff on drums, Hungate on bass (probably), and Foster on Piano (probably). We had one more song to record at it was getting near 6 o’clock. I had a 7 o’clock session (wanting dinner in-between the session) and made the mistake asking if the other guys had a 7 o’clock. Now one had a 7 call and that was all it took for the guys to start messing with me to stall the session. I had the first twelve or sixteen bars on my own playing a 12/8 finger picking thing. The guys started throwing matchbooks at my guitar while I was playing leading to strange sounding notes and rhythms. We all laughed and I asked the cats to let me get through the intro. The same crap happened on the next pass and I was getting slightly bugged. By the next pass, I had memorized the intro and would not look up at the music. Unbeknown to me, Luke had put down his guitar and was inching his way into my area walking backwards. Luke new when I would need to look at the chart and at that exact second, he pulled his pants down and shoved his hairy *** about 6 inches from my nose! Well, I started laughing so hard my stomach started to hurt!!! Will: Hahahaha! Great story! “Airplay” is considered by many to be a milestone in adulted-orientated rock, and maybe one of the first true "AOR" albums. Your collaboration with David Foster featured, amongst others, Jeff & Steve Porcaro, David Hungate, Tom Kelly and Luke. What do you remember about those sessions? Jay: I enjoyed writing the songs with David [Foster] and the many lyricists. The tracks with such great players ˜feel” good. Jeff used to say he did not play shuffles well. In fact, I consider NOTHIN YOU CAN DO ABOUT IT a certain kind of shuffle and Jeff owns that groove!!! David and I worked on the album between and while working on other record production projects causing the album to take around a year to complete (maybe sooner). I never considered myself a singer leading to much time spent on the vocals. That was difficult work but it turned out OK I guess. As always, David had a wealth of great musical ideas! We were young and overloaded the album with a huge amount of overdubs. Simply put, we ˜over-produced”. When we talk about this, David says something like, "There is no "air™ in the album until the song Bix. I agree. At some point, I would love to re-mix the album for many reasons. Will: Was Airplay ever intended to be more than a one-off studio project? Jay: At that point in time, both David [Foster] and I were producing full time so it would have been difficult to really be artists meaning putting together a band and go on the road. If the album would have been successful without going on the road (major radio airplay) priorities would have changed. We were dropped by RCA after the first album. I can’t remember why but usually caused by a regime change. We were offered a record deal with Warner Bros. but it did not happen for a few reasons. Will: You've worked extensively with Joseph Williams in recent years. Jay: I had wanted to work with Joe over the years and finally had the opportunity when working on the AIRPLAY FOR THE PLANET album. I simply called him up and we started writing a few days later. Total fun and all the songs turned out great in recording land. Will: In his recent Toto messageboard interview, Joseph relayed what a great and supportive friend you had been to him in the early 1990's, when he was having a tough time following his departure from Toto. By all accounts, you helped Joe get back on his feet! Jay: There was no doubt Joe would land on his feet. I must have offered encouragement along the way. Joe is so much fun to work with and what a talent! Luke and Joe are like brothers. Will: "Airplay for the Planet" is a really cool CD! You teamed up with a cast of fantastic musicians and vocalists including the late Warren Wiebe, Joseph Williams, Sherwood Ball, David Foster, Bill Champlin, Bruce Gaitsch and others! What inspired you to do a project under your own name as opposed to the Planet 3 and Airplay records? Jay: It was time to do a solo album. Regarding the cats you mention, surely the best of the best! Will: Following the release of "Airplay for the Planet", you did two great tours of Japan and Scandinavia. I'm told that there were rumours of a planned live album, but it obviously didn’t materialise. Jay: There were no plans of a live album. Will a live album happen? At this point no plans but maybe someday. Will: How was it touring with the incredible band you put together: Joseph, Steve Porcaro, Bill Champlin, Bill Cantos, Ned Doheny, Tris Imboden and Pat Mastelotto? Jay: It was absolutely great!!! All of the guys are pros and never any major problems!!! The tours were as perfect as could be!!! Will: You put a "call for charts" up on your website a year or so ago. Does that mean further tour plans are up your sleeve? Jay: A tour was in the works last year but did not work out. I still wish to tour in the near future but right now I am into looking for Artist production gigs. Just got PRO TOOLS HD 3. Time to put to major use in production land. I may record another solo album at some point in the near future. Will: A few members of your 1994/1996 touring band released great solo records following those tours (Joseph, Bill C., Sherwood spring to mind). What was your involvement in those albums? Jay: I played a solo on Joe’s record but I think that was it regarding the other guys. Will: Over the years, you’ve played scores of sessions with the Toto guys! Have you had the opportunity to jam with them recently? Are you a regular performer at LA jazz clubs or is your work mainly studio based these days? Jay: I occasionally play fundraisers with Luke (Casey Lee Ball Foundation). Regarding live gigs in LA, very rare. I do play on some sessions these days. In such cases, the PRO TOOLS files are sent to me as to play solos. I like working in this fashion and welcome such projects. Will: Looking back at your musical roots, you've released two albums paying homage to surf music and be-bop. What made you release these albums as opposed to a "westcoast pop" follow-up to "Airplay for the Planet"? Rake & the Surftones, again featured Luke (on handclaps and backing vocals), Joseph and David Hungate! Judging by the alias names you gave everyone on the album credits, you had a lot of fun making that 18 track party record! Jay: Yeah, why record a Surf album and a Jazz album since both hardly have a market. They came about by accident on account of studio gear tests. The 1994 earthquake toasted my house and studio leading to a major rebuild. I needed to test the gear and the rooms so I decided to record a surf album for fun since no big deal if technical problems occurred. The humor alone would have been worth the effort. Thankfully, no technical problems regarding the recording but there was a major smoke-out in the control room caused by a capacitor that burnt up in one of the 2-track recorders (not in use that the time). I wanted to play live with the guys as to get a feel of how the rebuilt room responded acoustically. Normally, I would engineer and overdub my parts later. I asked Ian Eales (he designed the studio electronically and is also a great recording engineer) and Mike Reid to engineer the tracking sessions. Note that this CD is meant to be serious in the 60’s surf style. I asked the cats to play like they were fourteen years old in their first surf band. On the other hand, the CD is meant to be extremely humorous. Not just the lyrics, but the playing as well. The liner notes are total inside humor. Surf names for all of the guys and a fantasy story regarding the recording. Serious or not? That depends upon the point of view when listening. OK, 18 tracks recorded during two tracking sessions. Mostly first takes since not looking for a polished performance. Most of the vocals were recorded on the 2nd night. Luke was one of the background singers on the Rake Mystery (or whatever it was called). Near the end of the song, we wanted an under water effect on the Ahh’s. A must listen in humor land regarding the technique used!!! All the vocals were recorded on Malibu Pier (written by Jim Cox in the Beach Boys style). The best melodic song on the CD with a very funny lyric. The singers are Joe Williams, Jason Scheff, and Craig Copland. All three singers sang lead alternating lines (as well as the BG stacks). Ask Joe to post his story on this song. Hahaha. Also on the 2nd night, it was time to add solos on the Surfers Toe Jam track. The track was designed to allow for 29 solos (I think). A bunch of guitar players were hanging out ready to play their surf solos. Luke, Biff Ball, Bobby Cochran, and others. So much fun!!! About a week later, I put together a night of guitar players to play more solos. The list is long and all are surely noted in the album credits. I had come up with humorous rules to tell the guys. I stated, "You guys get two passes at the solo. If you play too good and out of the surf style, a warning is giving. Do it again and I wipe the track. Tuning-up is optional and not recommended." Yeah, we all laughed and the solos were perfect!!! Joe had another song to sing (Hungate’s October In Oxnard) as well as a rap (Rake Mystery) he needed to write. We were laughing so hard, it was difficult to work!!! Great funny stuff!!! Yeah, off on a tangent but fondly reflecting on such a fun project. The Bebop album came about when needing to test the ALESIS M20 Pro ADAT format. I was hired as a consultant and beat tester by my good friend, Marcus Ryle. Since a pro digital recorder format of the era, I decided best to record a real band that included a wide range of frequencies (upper frequency information such as cymbals) and dynamics as to note how the "analog to digital/digital to analog converters" sounded. That led to recording a jazz album. Once again, if technical problems, it was not like loosing data from major time spent on a pop album. All tracks were recorded in one night (except for the Star Spangled Banner). This time I needed to engineer the tracking session as to test the M20’s keeping an eye out for software bugs, etc. Thankfully, no problems leading to the completion of the album. Yeah, there are always stories. Dave Weckl had the flu BUT still played his *** off!!! More stories for another time. Will: Great! I’m sure you've been asked this dozens of times, but your guitar solo on the Steely Dan track "Peg" is legendary! Walter & Donald explained on the Classic Album documentary that you were the only guitarist who managed to play what they had in mind. Have you ever found out who else tried that solo before you on that session? Jay: First, they did not know what they had in mind. They were just waiting for someone to play a solo that they liked. When watching the AJA video, I seem to remember that Walter had recorded a few tracks. There were other players but not coming to mind now. I bet Roger Nichols would know. If interested, you may want to ask him on his web site. I should mention that when I was driving to the session, my thoughts were to nail this solo! Gladly, that transpired! Will: What projects are you currently involved with? You mentioned that you had plans to record another solo album. Jay: I was the last holdout to get PRO TOOLS. So about eight months ago, I bought a PT HD3 system and use in conjunction with my NEVE V console. I decided the best way to learn the PT system was to transfer old analog recordings to PT. Since I was going to spend major time fixing the sonics, I thought I might as well make sound as good as possible and release the stuff. I did not replace any music or vocals except for one bass note that had a serious sonic problem causing my a tape recorder malfunction around 30 years ago. Ironically, I still have the same bass and DI used for the recording. The original sonics are not good but with the help of PT using many automated EQ’s, compressors, etc., the stuff sounds pretty good. The CD is Jay Graydon PAST TO PRESENT “THE 70’S” available through www.jaygraydon.com and CD BABY. Some of the songs are from AIRPLAY as demos or tracks not completed. Me on some vocals, guitars, bass, and synths. Jeff Porcaro, Mike Baird, and Willy Ornelas on drums, David Hungate, Mike Porcaro, etc. on bass. David Foster and Greg Mathieson on keyboards, and Bill Champlin, Tata Vega, Marc Jordan and others on vocals. I humbly state this CD will be of interest to those that appreciate the pop music if the 70's! Note this stuff was never released until now. Regarding another solo album or band project, that may happen. The next thing I want to do is get back into producing full time for a while. Will: You've got a lot on your plate right now Jay but what do you like doing when you can get away from the studio? Jay: I like to play straight ahead jazz. I need to do more of that since so much fun!!! Will: That's great. Thanks a lot for your time Jay. It's been cool chatting with you! Is there anything else you'd like to add? Jay: These days, pop music is starving for better melodic input. We need something like another Beatles to change the frame work. For more information, visit www.jaygraydon.com and check out the discography and soundclips of Luke's sessions with Jay at www.stevelukather.net Thanks to Morten Nordhagen Ottosen for his suggestions and help with this interview.